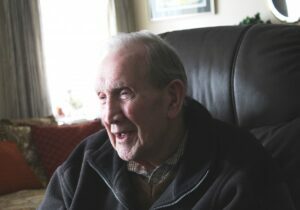 Bertrand Edward Perry (known to all in Cartmel as Freddy) was born in Brockley on 17 December 1922 and has been living in Cartmel at 2 Priory Gate since 1973. Freddy kindly lent us his collection of postcards comprising 266 in total. It is very interesting to see the evolution of Cartmel over the years, with buildings changing use or look, the changes in the cars even the dress code where there are people. Interesting too is the content on the back of the cards where one can see the language used, the cost of postage, cost of purchase and changes in post code requirements. A PDF document showing the reverse side of the postcards is being created and will be published soon.